Sharp is showing new 7" MEMS-Shutter Display prototype at Ceatec 2013. MEMS-Shutter displays are similar to LCD in that they have a LED backlighting unit (BLU), color filters, and a component that blocks the light. But instead of liquid-crystals and polarizers, these displays use MEMS shutters. A MEMS-Shutter Display is about 6 times more efficient than a regular LCD. This is mostly due to the fact that you do not need a polarizing filter like in LCDs. The displays also use a WRGB structure in which there is a white subpixel which increases brightness and efficiency. 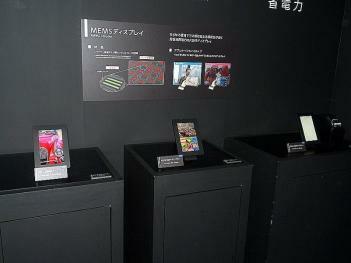 The panels on display had a resolution of 800x1,280 (220 PPI). The backplane is an IGZO. Sharp co-developed these panels with Qualcomm.